On September 28th, China’s National Day, a number of Hong Kongers began to raise their voices for democracy against the Chinese government. The protests were first formed by a group called Occupy Central With Love & Peace, which was led by Benny Tai, professor of Hong Kong University. 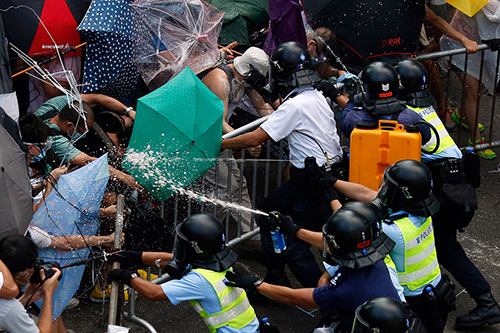 The protests became known as the ‘Umbrella Revolution’ or ‘Umbrella Movement’ because protesters used umbrellas as tools to block tear gas and pepper sprays used by the police. The protests were organized mainly to regain Hong Kong’s full democracy from the Chinese government and to express dissatisfaction with the chief executive, C.Y. Leung. Meanwhile, the police have been criticized for their actions towards the protesters, with many seeing their response as being brutal and violent. Tommy Chan, a Hong Kong resident attending the Hong Kong Design Institute, said, “The police here are pretty corrupted. Just this morning, a man was held by several policemen and beaten up by them in a park.” Nevertheless, the Beijing government does not seem willing to negotiate with them even though the tensions are continuously increasing. In order to appease them, the Beijing government announced that they would allow direct election, starting from 2017 Chief Executive Election. Despite Beijing’s decision to change the system, the recent protest broke out due to the preconditio to this change. To be specific, the 2017 election will proceed in the following way. First, an electoral committee of 1,200 members vote on candidates and decides on three final candidates. Then, the citizens of Hong Kong vote for one of these three. This process has been controversial since only Beijing loyalists will be selected as the three candidates. Thus, the citizens are restricted to vote only for pro-Chinese leaders, and as a result, angers have arisen among a large number of Hong Kongers. Eventually, they formed protests for a genuine free election. Liu Xin, a junior majoring in International Trade at Dongguk University, said, “Hong Kong was originally a part of China, and when Hong Kong was returned to China from Britain, the Chinese government has given her many advantages in the name of ‘One Country, Two Systems.’” Actually, Hong Kong’s Basic Law, also called its ‘mini-constitution,’ has enabled Hong Kong to enjoy civil liberties, such as freedom of the press, the right to protest, and an independent judiciary, lacking on mainland China. However, the Beijing government claimed that Hong Kong does not enjoy ‘full autonomy’ according to the policy released in June and stated that Hong Kongers are confused in understanding the meaning of ‘One Country, Two Systems.’ They then asserted that it is necessary and essential for them to choose the candidates who love Hong Kong and as well as China in order to maintain the country’s security, sovereignty and development interests. China also denounced Britain and the United States for interfering in its national conflict. As the United States has shown its pro-democratic positions on this issue and supported the protesters, the Beijing government criticized the U.S. by saying that all nations should respect each other’s sovereignty. Cui Shengxian, a Chinese junior at Dongguk University, added, “Although it is possible for some of the capitalists in foreign countries to agree with the protesters’ arguments, other nations have no right to intervene in China’s internal conflicts.” Although the protesters and the government opened an official talk on October 21st at the Hong Kong Academy of Medicine, they were unable to come up with a solution, as both sides do not seem willing to negotiate their demands: protesters wanting a direct election system and the government requesting them to stop the protests. Meanwhile, the business sector is showing its frustration with Occupy Central. They fear that if the protests take place in any financial district, Hong Kong’s reputation for being a safe and steady place to do business would be downgraded. In fact, pro-Chinese groups are showing their rage against the pro-democracy groups by destroying their tents and barricades, while wearing blue clothes or ribbons. It is undeniable that if the protests continue for a long time, blocking the districts, it will eventually lose its supporters. Despite the ongoing protests, many people seem to be pessimistic about whether the Beijing government will listen to the protesters’ demands. Jody carefully maintained, “I do not anticipate China changing its policies any time soon. If anything, China is more convinced than ever that she needs a firmer grip on Hong Kong. Yielding to the protesters’ demands would be a sign of ‘weakness’ and would contradicts with the way China has handled the Tibetan crisis.” Professor Ho then added that even though Beijing is unlikely to accept the demand of the protesters, they do not want to worsen the situation at the same time. To be specific, they do not want the ‘One country, Two systems’ program to fail since it is the heart of their unification policy. In fact, it is preferable for Beijing to be more flexible to the protesters’ demands in order to strengthen their will for ‘One country, Two systems.’ He then added, “It is recommendable for Beijing to partially accept their demands.” He said, for example, Beijing could adjust the constituting members of the electoral committee or the standards of election candidacy to broaden the range of freedom and democratic principles.